Today is my Day to post what I came with for the theme "Dots on Dots" in either 10.5 or 12.5 in Squares. I was so excited when this theme was announced. I had so many different directions that I could have gone; I kept sketching and scheming with many projects in my mind. I don't know what exactly happened but I definitely had dots on the brain this week! The funny part was I actually didn't realize it until I was reading Jane's Post. I was quite proud that I had not bought Dot fabric this past weekend, just some backing fabric for my City Weekend Project. <Sigh> And then I took another look at the fabric and it was a light blue dot fabric on a darker blue background. I also started to notice that all my fabric choices this week while "shopping" my fabric stash has had dots on it like these two blouses I am working on for my little Darling! 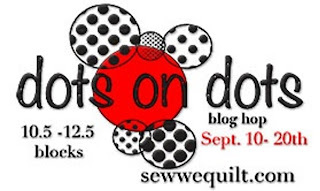 My Husband came up with this idea of making a Dachshund dog out of dots, he was excited about being so clever so he gets an extra 1,000 points for giving me the idea--the points don't really mean anything. It's just a fun thing we picked up from Whose Line Is It Anyways? (which is an American TV Show). It's a good idea though it did not go anywhere, but it was great to have my husband try to participate! I loved this paper-piecing block project as soon as I saw it. If it wasn't for the Bowls With Borders Blog Hop I would not have had the courage to go into projects involving paper-piecing. I cannot for the life of me remember where I got the pattern for this block besides somebody's blog (As soon as I can figure it out I will give credit!). I have 3 more blocks that I plan to make into another baby quilt, pillow cover or wall hanging perhaps. My First paper-piecing project had been the Bowls With Borders Blog Hop project (Another SEW We Quilt Blog Hop). I tried to make HST using the new-fangled "sew on the outside of a square on square" method, but no matter how careful I am, I seem to end up a little off. I decided to use that to my advantage and purposefully make my pinwheels wonky this time! Wonky blocks are new to me since I first took part in the Wonky House Block Exchange earlier this year. My original idea was to make a larger block of 4 blocks with sashing that would make the blocks alternate but I went on auto-pilot and ended up sewing the wrong sashing and so this is where the project ended up! Nice straight rows with lots of dots--even the white fabric has dots printed on it! I also ended up swiping a couple wonky pinwheel blocks to make this quick little table runner in Purples & Greens. Don't Forget to check these other blogs out today! What a wonderful array of dotty projects, the dotty star is fantastic. That is one load of dots! You did loads. I like all your projects but I love the star block! Not to create a problem with your husband, but I would like to see that dotted dachs! I love your dotty star, it is sew beautiful. The wonky pinwheels are sew cute. But why didn´t you try to make that Dachshound I think he could be very cute with all those dots on his body and smaller dots on his hanging ears. I made a dotty horse, in my dotted day, yesterday, that the blog hopping ladies were very excited over. Morning my dear...oh my have you been busy, takes a lot of patience to get these projects done....your dotted star well it is shown somewhere else today..yes it is...it is that good.. Your dotty star is beautiful! I love your table runner...it is just perfect...ok, a bit wonky but perfectly wonky! OH WOW!! I love that dotted star!! The pinwheel quilt is fantastic too but I can see a whole quilt in that star sashed in black!! I agree, your star is spectacular! I do love your wonky pinwheels too! Love your star and I think we all are having dots on the brain lately. It's kind of like when you have a new car, and all of a sudden you see that same style car everywhere and you never even noticed it before. I like that star block and the white dotty background fabric went perfectly with it. Your others are great too. Your star block is simply stunning. Your star block is wonderful. Would never know you were a newbie to paper piecing. Love the idea of going wonkie with the pinwheels. Great table runner too. Oh, love this star pattern - and wonderful in dots. A sweet quilt and runner, too. Thank you for sharing with us today. Lots of inspiration. I love all of your dots on dots! Stunning star & pinwheels! Great use of color! Love the hubs' block.....BUT lovin' the wonky pinwheels MORE!! NO pressure sewing-what I live for!!! THANK YOU!!!!!!!!!!!! Fantastic! I really love that white on white dotty fabric! Wow! What a great set of dot projects. Thanks for sharing, you gave me some ideas. Your wonky pinwheels are fabulous! Your fabrics are great too. Thank you for sharing. Lovely projects. Thanks for sharing your inspirations. I see why this star was one of the top two today! Beautiful! Great job! Love your star and your pinwheels are full of dotty goodness , great job! Lot of dots in your projects! I love that paper pieced star...it is fun to make! I made it for the red, white and blue hop this summer. Thanks for sharing! I love them all, and REALLY love the star -- what a great use of colors! -- but I want to see the dachshund, lol! Love the star. The colors and the dots make that work so well. Thank you for sharing. "Great Job!" to the hubby. Love all of your projects - particularly the star - thanks for sharing. All the projects are great,I like them all. I love Star blocks and yours is beautiful! You did a great job making it. Your pinwheel blocks are great, also. I love the quilt that you made. Thank you for sharing all your wonderful projects today. Oh wow....I love all of your dots....that star is amazing! The star is really cool, it looks great outlined in the black. Love the center. And that wonky pinwheel, can't get more dots than that - how fun! Oh my gosh.......I literally gasped when I saw your star block. All of your blocks are amazing but that one keeps me coming back! Love all your dotty inspirations! Great work! I'm very proud of you!1 Top 2!!! How's the new baby?? I love the rainbow block. Any time I can inspire someone to buy fabric, I have done my job!! You hubby is so sweet. what a fun idea BUT I adore your block. That is one reason why Ilove these hops we "try" and boy you did an amazing job. Did someone say pinwheels, I love them and wonky, oh yes! Thanks so much for sharing. Your little girl will look so sweet in those dots. The paper pieced star is incredible. I love the fabrics you have used for them. You were super productive with your wonky pinwheels too. I love your husbands idea of the dots-hund. That would have been classic! Dotshund! How funny. My kids would have loved to see that, they love those dogs. Very pretty blocks. I especially liked the first one. I love the amazing dot star. Your wonky pinwheels is very cute. Some times mistakes turn out great. Thanks for sharing your talent. Fabulous pieces, your bordered star is gorgeous! Love your multi colored dotty star square-Wow! That's a mouth-ful. Your pinwheel quilt is great- I just love anything with HST because they are so easy. From California, thanks for sharing. WOW wow WOW wow YOur blocks are so wonderful and perky. I adore the colors. Oh! I love the paper pieced star block! Wonderful! I love your dotty star it just shine's with all those bright dots. The other projects are wonderfully creative to. Thanks for sharing. lovely dots thanks for sharing! Wonderful dotty creations! The large paper pieced star is stunning. Thank you for sharing. Your star stole my heart! The wonky pinwheels are super chearful! Thanks for showing. That star knocks my socks off !!!! Just beautiful work!! Love your dotty blocks ~ that Star up top is amazing! Lots of wonderful dots in this post. Love the star! and the pinwheels are perfect. Thanks for sharing your wonderful creativity with us. I love your star! It just shines!!! Love your paper pieced star block...amazing for being a new paper piecer! Very pretty!!! Thank you for sharing!!! I love, love the dotted star block! I love your dotty stars! How fun. I really like the star... great job on that one! And all those pinwheels! Wow! ...and I'm a new follower. Totally delicious dotty star!!! You certainly went all out with your dotty pinwheels and that fab table runner!!! Love your creativity and energy!!! I LOVE, LOVE, LOVE that star!!! Great job! Love the star! That would be a great runner for ST Patricks day. You certainly made lots of dotty projects. I was impressed particularly with the paper-pieced star. Love the pattern and your choices of dotty fabrics. That band of black in the block made the star just pop. The white bubbly dots fabric background was great. Thanks for sharing your projects today The star is wonderful! Your projects are all wonderful! I think the pinwheels all in dots looks so good. I love the fabrics you picked for the star. You were super busy!! Love your quilt!! Great projects! Your star block is amazing. Your projects are all really pretty. I especially love the star quilt. The addition of the black fabric makes the stars pop. wowza! that's Anna's Lone Starburst (http://six-white-horses.blogspot.com/2012/01/lone-starburst.html) I only know because I tried to make it an failed desperately!! Yours looks beautiful1! What wonderful dot projects and your paper pieced dot star is beautiful!! Love your paper pieced star. And you wonky pinwhelel projects are so cute!!! Wow, wow, wow! Love the pinwheel quilt, love the table runner but that paper pieced star, it's fabulous! Love your dotty star!!! Thanks for sharing! You really went all dotty and out on dots for us! Thanks for sharing.